As a child, I was a voracious reader. I devoured everything in sight- powering through my community library's shelves at a ridiculous speed, with little pickiness on the author, topic, or genre. I loved being able to immerse myself in any subject matter, being able to allow myself to slip into another world or character's shoes for a little while. As I got older, this love only grew, and soon my love for reading turned into a love for writing, and the rest is history. I wanted to share with you my top five books to change your life. Each of these books has taught me something different about not only the way the world works, but about myself and how I operate. These books are uniquely special to me, and I can trace each one back to a certain time in my life where I was developing a new perspective, habit, or coming to a new revelation about who I am and how I fit into this world. The Yamas and Niyamas is the book "that started it all." When I first started attending classes at Just Be, my teacher and mentor Jenni gifted me this book. When she gave it to me, she described it as being like her Bible, and I now understand what she meant by that. Each page in this book is saturated in teachings relevant to all of our lives, regardless of who we are or where we come from. Adele combines personal stories with age-old wisdom to create a powerful resource for personal reflection and life evolution. I particularly love the journaling prompts she provides at the end of each section, which helped spur my personal journaling practice. If you're not sure where to begin with learning how to live a more mindful, reflective life, I recommend starting with The Yamas and Niyamas. It's a small, digestible book that isn't as intimidating as other resources sometimes appear. As Jenni warned me when she gave it to me, it's not necessarily a "read cover to cover" book- it's one where the page you happen to turn to is the one you need to be on. I'm constantly surprised by how relevant any passage I land is to what I'm going through at that time in my life. This book was introduced to me by my favorite English teacher of all time in high school. It was the first work by Malcolm Gladwell that I was exposed to, and I've since fallen in love with all of his writings. This book explores a topic I had never considered: how we think without thinking. Gladwell asks how our subconscious can affect our decision-making and leadership skills, and explains the different ways our brain operates as we navigate life and its challenges. This book left me in awe of just how complex and mysterious our brain truly is. Since reading this book, Gladwell's concept of "thin-slicing" (being able to extract the most important information from a world flooded with minutia) has been one of the "tools" I keep in my mental tool box. As someone who loves to research, research, research, and get as much information as I possibly can, the idea that the most effective decision-makers often are using their subconscious more than they are spending hours deliberating or collecting data. I'd recommend this book to anyone who wants to improve their leadership and decision-making abilities, particularly young adults beginning college or exiting high school, or young entrepreneurs with budding businesses and big dreams. If you're anything like me, you develop an emotional attachment to your clutter. You cling on to old t-shirts, essays written in middle school, and jewelry you've never worn because you used to love it/what if you need it someday/it was a gift. And while I'm all for being sentimental, this can lead to an excessive amount of clutter not only in the form of trinkets and old clothes, but in lingering emotional attachments and mental overload. In this book, Kondo provides readers with a sure-fire method to de-stress and de-clutter their homes and their lives. I really appreciated the idea that each item in our homes should serve a purpose, and once that purpose has been completed, passing it on to a friend, charity, or recycling center is not "getting rid of it", but rather allowing it to continue serving its purpose. I know that whenever I attempted a spring-cleaning or closet purge before reading this book, I struggled to get rid of things because I simply felt bad about it. It felt like tossing out garbage- garbage that had meant something to me. By applying Kondo's methodology however, I'm able to keep cleaning and organizing a much more positive and effective experience. Even if you don't think you're a messy person, read this book. You won't regret it. You'll be surprised at what baggage- physically, materially, and emotionally- you're carrying around that you may not even be aware of. This is one book that allowed me to completely change the way I view and treat myself. For a long time, I struggled with the idea of being an introvert vs. being an extrovert. I wasn't shy, but I preferred alone time over big get-togethers, often felt exhausted by long periods of socialization, and required quite a bit of motivation to get outside my bubble. Cain dispelled the myth I believed for the majority of my life that introverts can't be effective leaders or communicators, and even allowed me to believe that they may be some of the most effective ones. "Cain proposes that introverts carry their own distinct set of powers, and learning this information changed my approach to life and view of myself. I’ve always considered myself capable of leading groups, but felt lost when it came to one-on-one relationship development. I felt inadequate because I preferred a night in with a good book to a wild party (or even a casual get together). I felt broken because I simply didn’t desire the elaborate social lives of those around me. And yet Cain revealed in her book that while I may be an introvert, that doesn’t mean I’m broken- it’s just who I am, and there are countless others exactly like me who are wildly successful for precisely that reason." You can read the rest of my thoughts on the book and on being an introvert in an extroverted world here. I'm completely fascinated by the topic of habit research. One of the most interesting things for me to learn about is understanding how and why we do things the way we do- how do we form our own unique habits? What influences the way we decide to live our life? How do we change and break negative habitual patterns? Duhigg explores these ideas and more in a book that I would highly recommend to anyone who wants to optimize the way they live their life. Duhigg includes cutting-edge research that definitely appeals to the fact-driven side of me, but he also includes testimonies and stories that nearly read like a good fiction book. The science and the engrossing narratives combine to make a completely engrossing learning experience that never feels overwhelming or out-of-reach. 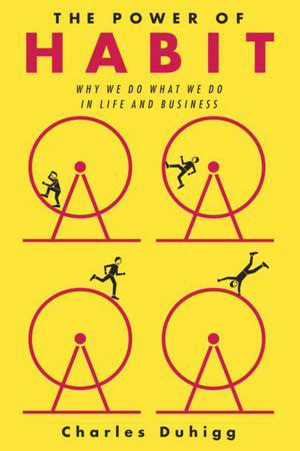 My biggest takeaway from this read was that while our brains seem to work in ways beyond our control, understanding the nuances in its operation can optimize our lives and pursuits. I included parts of Duhigg's work in this post on my blog, which I'd recommend giving a read to gather more information on the book.